Sofa beds are a quick and easy solution for all guests. We’ve designed a variety of stylish pull-out beds to match our popular sofa ranges. Incredibly versatile, sofa beds make a useful addition to the study, guest bedroom, or living room –working especially well in smaller homes where there isn’t enough space for a spare room. We only use the best quality materials, so you can enjoy a sofa and bed that’s just as comfortable as all the others in your home. All our sofa beds have been designed to complement at least one of our sofa ranges, allowing you to create a coordinated look with minimal fuss. There are all kinds of sizes available, including 2 seaters and 3 seaters, and we even have armchairs for those who just need a single mattress. Doubling up as stylish seating during the day and a comfortable bed at night, they’ll perform twice the function for a fraction of the price of a separate sofa and bed. Comfortable frames and mattresses ensure a cosy lounging area in the day and a snug bed at night. The easy-to-operate opening mechanisms have been designed to help you set the bed up quickly when friends or family are staying over last minute. 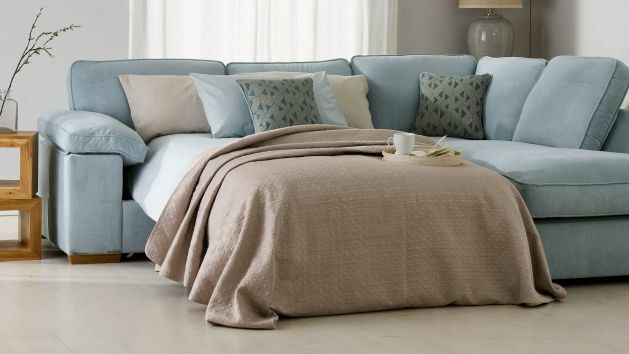 Simply remove the seat cushions and pull out the frame to reveal our high-quality mattresses. We offer two types of mattresses for our sofa beds. The deluxe mattress is a luxurious option and boasts a comfy sprung base that will send your guests off to sleep in no time. This is the ideal choice if you’re looking to use the bed on a regular basis. And for those who are looking for a more affordable option, the standard mattress ticks all the boxes in terms of comfort and budget. Browse all our cosy sofa beds and complete the look with one of our matching storage footstools – ideal for keeping those extra bed linens handy.